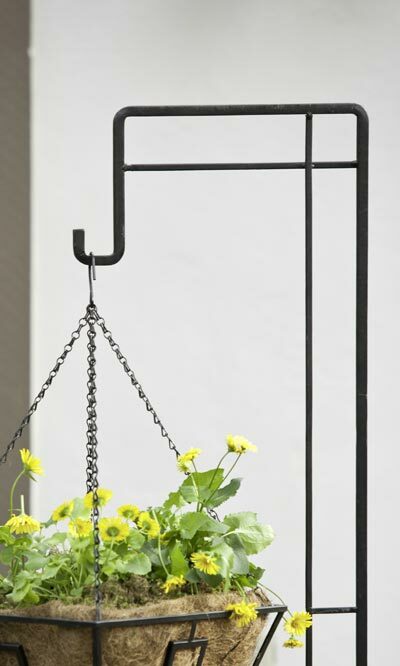 Add an updated hanger to your bird garden with the Panacea Contemporary Shepherd Hook. The angular frame and straight lines on this piece bring a modern hint to a classic garden accessory. Square steel bars create the body of this item, with a 7.5" long top arm culminating in a small hook. Secondary, thinner metal bars run parallel to the larger frame, with small bars connecting the two together. This creates both square and rectangular detailing on the piece, adding interest. The black, powder coated finish offers a classic look, and the 7.25" long, "step-in" base easily anchors the hook into your soil. Display bird feeders or wind chimes in an exciting new way with this Contemporary Shepherd Hook. Note: This description refers only to the Panacea Contemporary Shepherd Hook. The basket shown is not included.